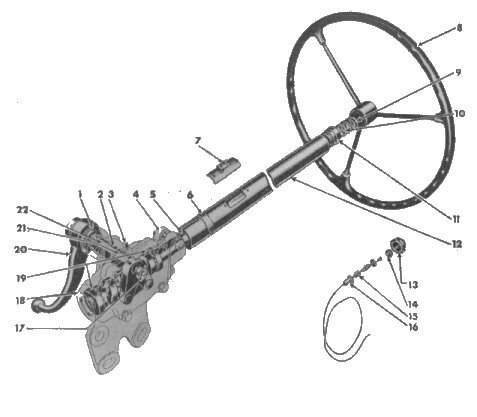 The “Steering System” is illustrated in Fig. 30. It requires little attention other than proper lubrication and maintaining correct alignment. Alignment may be thrown out by striking curbs or other obstructions. Looseness in the steering system will also affect alignment. It is impossible to satisfactorily align front wheel without first adjusting the various connections, including the front wheel bearings. The correct toe-in of the front wheels is 3/64” – 3/32” which must be accurately measured for satisfactory front tire wear and steering. The best method of checking wheel alignment is by the use of the wheel alignment device, which is available in most every well equipped shop. Periodic inspection and tightening of the steering parts will aid greatly in maintaining alignment. Keep the steering connection rod and tie rod ball joints snug; they must operate freely without lost motion. Keep the steering gear arm No. 6 tight on the lever shaft and the steering housing bracket tight on the frame. For adjustment of the front wheel bearings see the next section, “Front Wheel Bearings”. 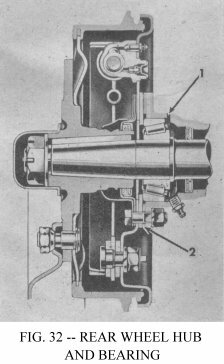 The bell crank No. 4 is mounted on the frame front cross tube and swivels on two needle bearings. The mounting shaft is removable from the frame bracket by driving out a tapered locking pin. The bell crank tie-rod ball is replaceable. Should the bell crank become bent or damaged, install a new part. Do not tighten the steering gear to dampen out steering trouble. Should trouble develop, consult your Willys-Overland Dealer, as he has a definite procedure for the inspection and adjustment of the steering system. The front wheels are mounted on two opposed tapered roll bearings. These bearings are adjustable for wear and their satisfactory operation and long life depends upon periodic attention and correct lubrication. Loose front wheel bearings may cause excessive wear and will affect front wheel alignment. If the bearing adjustment is too tight, the rollers may break or become overheated. To check the adjustment, first raise the front of the vehicle so that the tires clear the floor. Check the brakes to be sure they are free and fully released. With the hands, check sidewise shake of the wheel. If the bearings are correctly adjusted, shake of the wheel will be just perceptible and the wheel will turn freely with no drag. Should the test indicate that adjustment is necessary, remove the hub cap axle shaft nut, washer, driving flange and shims. See Fig. 25. Wheel bearing adjustment will then be accessible. Bend the lip of the nut locking washer so that the adjustment lock nut and washer can be removed. Rotate the wheel and tighten the adjusting nut until the wheel binds slightly. Then back off the nut 1/6 turn, or more if necessary, making sure the wheel turns freely without sidewise shake. Replace the locking washer and lock nut and bend over the locking washer lip. Check the adjustment and reassemble the driving flange, nut and hub cap, being sure to replace the shims. Each rear wheel is carried on a single tapered roller bearing which is adjusted by shims placed between the brake backing plate and the axle flange. Check wheel bearing adjustment in the same manner as the front wheel. Should the check determine that adjustment is required, remove the hub cap; remove the cotter pin, the axle shaft nut and use a wheel puller to remove the wheel hub. Remove the bolts holding the brake dust shield, the grease and bearing retainer and the brake assembly. Remove or install shims, Fig. 32, No. 2 to adjust the bearing with .001" to .003" end float which will be just perceptible when tested by hand. The shims available for this adjustment are .003" - .005" and .030" thick. Examine the grease retainer to be sure it is serviceable -- replace it if in doubt, and reassemble. When the vehicle is used for road work, lubricate and adjust the front wheel bearings once each year; if used in dusty field work, twice each year. The bearings should be given more than casual cleaning. Use a clean stiff brush and suitable grease solvent to remove all particles of old lubricant from the bearings and hubs. After the bearings are thoroughly cleaned, inspect them for pitted races and rollers and check the hub oil seals. Repack the bearing cones and rollers (see "Lubrication Section") and reassemble in the reverse order of dismantling. Adjust them as directed in the preceding paragraphs. Lubricate the rear wheel bearings sparingly. Oil forced from the oil relief hole No. 1, Fig. 32, indicates when the bearing is amply lubricated. Should it be necessary to adjust the bearings, clean them thoroughly and repack them with the recommended lubricant. The wheel mounting nuts and studs on both left wheels have left hand threads to prevent them from being loosened by wheel action. The studs are identified by an "L" stamped on the end. The left hand threaded nuts are identified by a groove cut around the hexagonal faces. To remove the left wheels, the nuts must be turned RIGHT, and to remove the right wheels, turned to the LEFT. 7:00 x 15 Tires 28-30 lbs. The importance of correct tire inflation cannot be overemphasized. To secure the maximum tire life and most efficient vehicle operation, it is imperative that these pressures be maintained for all normal vehicle operations. Then the vehicle is used with driver only doing agricultural work on very sandy or muddy soil, increased flotation and wheel traction may be secured by decreasing the pressure of the 6:00 x 16 tire to 18 to 20 lbs., and the 7:00 x 15 tire to 14 lbs. Should unusual operating conditions require this reduction in pressure, use care that the tires are inflated to the recommended pressure immediately when normal operation is resumed. To secure maximum tire wear, the wheels should be switched at least twice each year. The rear wheels should be moved to the opposite front positions and the right front wheel moved straight back to the right rear position. Place the spare on the left rear and use the left front as a spare. To remove a tire from a drop centre rim, first deflate completely and then force the tire away from the rim throughout the entire circumference until the bead falls into the centre of the wheel rim, then with a heavy screw driver or tire removing tool, used opposite the valve, remove one side of the tire at a time and remove the inner tube. Installation of a tire is made in the same manner by first dropping one side of the tire into the centre of the rim and with a tire tool, spring the bead over the wheel rim, using care not to damage the inner tube. When mounting the wheel, alternately tighten opposite stud nuts to prevent wheel wobble. After nuts have been tightened with the wheel jacked up, lower the jack so wheel rests on the floor and retighten the nuts. The springs should be periodically examined for broken or shifted leaves, loose or missing rebound clips, angle of the spring shackles and the position of the springs on the axle saddles. Springs with shifted leaves to not have their normal strength. Missing rebound clips may permit the leaves to fan out or break on rebound. Broken leaves may make the vehicle hard to handle or permit the axle to shift out of line. Weakened springs may break causing difficulty steering. The front springs are interchangeable, as are the two rear. 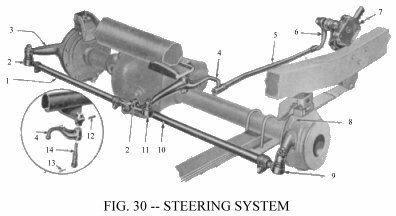 The front ends of the front springs and the rear ends of the rear springs are shackled, using "U" type shackles with threaded bushings. The rear ends of the front springs and the front ends of the rear springs are bronze bushed and pivoted on bolts in the shackles mounted on the frame. The spring shackle threaded bushings use right and left hand threads, depending upon where they are to be used. Six bushings are used with right hand threads and two with left hand threads. For identification the right hand threaded type have plain hexagonal heads. The left hand have a groove cut around the heads. The two left hand threaded shackles can be identified by a small forged boss on the lower shank of the shackle. They are used at the left front and the right rear springs with the left hand threaded end down at the spring eyes. The bushings are anchored solidly in the frame brackets and spring eyes and the oscillation taken between the threads of the "U" shackle and the inner threads of the bushings. The lubrication of the shackle bushings is very important and should not be neglected, or excessive wear of the bushings and "U" shackles will occur. The shackles are installed with the bushing hexagon heads to the outside of the frame. Install the shackle grease seal and retainer over the threaded end of the shackle up to the shoulder. Insert the new shackle through the frame bracket and the eye of the spring. Hold the "U" shackle tightly against the frame bracket and start the upper bushing on the shackle, care being taken when it enters the thread in the frame, that it is not cross-threaded. Screw the bushings on the shackle about halfway, and then start the lower bushing, hold the shackle tightly against the spring eye and thread this bushing about halfway, then alternating from top bushing to lower bushing, turn them in until the head of the bushing is snug against the frame bracket and the bushing in the spring eye is 1/32" away from the spring measured from the inside of the hexagon head to the spring. Lubricate the bushings with high pressure lubricant and then try the flex of the shackle, which should be free. If the shackle is tight, it will cause spring breakage and it will be necessary to rethread the bushings on the shackle. The shock absorbers are of the direct action type giving two-way control, however they are not adjustable. They dampen spring action, as the vehicle passes over irregularities in the road. The shock absorbers are mounted on rubber bushings at both top and bottom. Should squeaks occur in the bushings, add a flat washer on the mounting pins to place the bushings under greater pressure and prevent movement between the rubber and metal parts. DO NOT USE mineral oil to remove squeaks.